Morecambe boss Jim Bentley spoke of his pride despite seeing his side ship a three-goal lead as they drew 3-3 with Portsmouth on Saturday. Jayden Stockley’s 95th-minute header handed 10-man Pompey a point after The Shrimps had raced three goals to the good inside the first 40 minutes. Bentley said: “Coming into the game and knowing what we were coming up against a lot of people wouldn’t have given us a chance of getting a point. “But we’re gutted we haven’t got the three points. “We had decent chances to wrap the game up and didn’t take it and with the last kick of the game they’ve scored. “But the performance first half was absolutely brilliant. Five or six wouldn’t have flattered us. 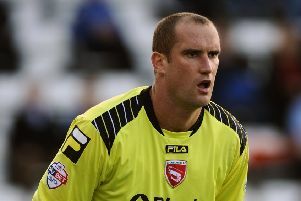 “They’ve got a player in Gary Roberts who can make things happen, one of the best in the league. “It was a great free-kick and after the second it was all hands to the pump. “The sending off didn’t change anything because for me we were nearly down to 10 due to injuries and the lack of games in the lads’ legs. “Jamie Devitt could barely walk at the end, Shaun Miller was lacking games, Alan Goodall came off injured, we had to throw Adam Dugdale in with half a pre-season because of suspensions and Shaun Beeley was a doubt for the game and soldiered on.